I heard that the guys at MatadorGoods were running a "favorite mountain" trekking and climbing photo contest. Since those are both things to do, I submitted a favorite of mine from Nepal. Forget favorite mountain, this has to be one of my favorite spots on the planet: period. Khopara ridge is within a day or two’s trek of the popular Annapurna circuit in Nepal, but only sees 10s of visitors a year. 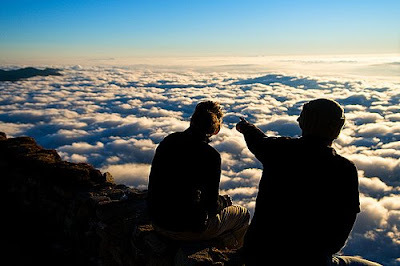 A single rocky trekker’s hut graces the top of the ridge, and lets you sit and contemplate life high above the clouds. Apparently the MatadorGoods photo editors and I have similar taste, and my win scored me a copy of Trekking + Climbing: The Andes by Val Pitkethly and Kate Harper. The book features 26 treks and 18 climbing Peaks in the South American wilderness. I've never been to South America...I'm hoping maybe this will inspire me to plan a trip. Oh yeah. That's my favorite TOO! I'm so glad that photo will be seen by more people, it's a gift from the mountain. Congratulations. Reads and looks like someplace exquisite.